The Grim Reaper (Eric Williams) is an old-school Marvel Comics villain, who first appeared in 1968. He’s primarily an enemy of the Avengers, with a deep involvement in the backstory of Wonder Man and the Vision. This older profile covers his appearances as a living man. There is a separate profile for the Grim Reaper as a zombie. When feasible we’ll cover his career as series of more specific profiles, since Grim Reaper’s abilities tend to vary depending on the plot. Known Relatives: Sanford Williams (father, deceased), Martha Williams (mother), Simon Williams (brother). Group Affiliation: Ally of Count Nefaria and leader of the Steelskulls; former Leader of Las Vegas Maggia faction. Former Leader of the first Lethal Legion, former leader of Hydra fragment in New York, former ally of original Space Phantom, Ultron, Nekra, Black Talon II, and Goliath. Former member of the third Legion of the Unliving. Former ally of Lloigoroth of The Nameless Ones, Former ally of Blackheart, Former leader of the fourth Legion of the Unliving. Height: 6’4” Weight: 225 lbs. Eyes: Blue Hair: Gray (originally blond). 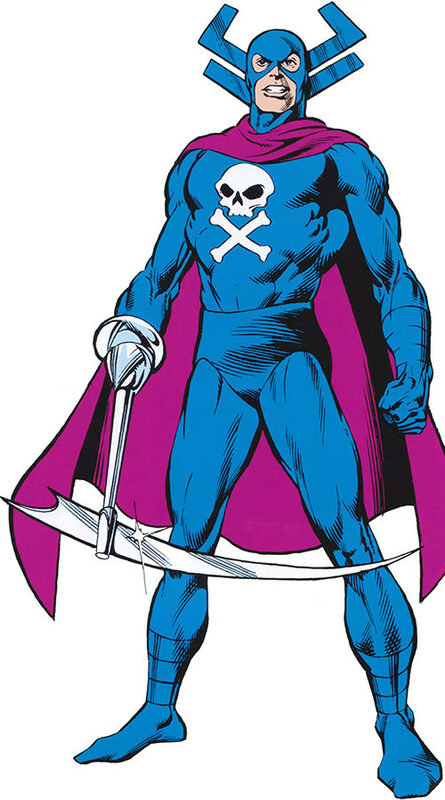 Williams possesses no superhuman powers, but does wield a scythe in place of his right hand. Presumably, his current scythe has the same abilities as his previous cybernetic scythe that was once permanently bonded to his right hand. A cerebral stunner (inducing paralysis). A blade-spinner (which allows the scythe to act as a buzz saw, a shield against thrown objects or bullets, or as a rotor providing very limited flight and parachuting capabilities). Eric Williams is the brother of Simon Williams, better known as Wonder Man. He descended into a criminal career rather than join the family electronics business. Simon was forced to embezzle from the business to cover Eric’s criminal activities, which ruined his life. When Simon sacrificed himself to save the Avengers from Zemo’s Masters of Evil, Eric went mad with grief. He wrongly blamed the Avengers for Simon’s death. Armed with a high-tech miniature arsenal in the form of a scythe, Williams dubbed himself the Grim Reaper. He set out to kill the Avengers in his brother’s memory, but they defeated him. Williams was confused and tormented by the existence of one Avenger in particular: the Vision. Williams came to regard as an obscene mockery of Simon since Vision’s mind was created from Simon’s brain patterns. Eric Williams returned again to menace the Avengers, forming the original Lethal Legion, and was defeated once more. Williams next secretly offered to transfer Vision’s mind into Wonder Man’s body and make it live again. In exchange, Vision wouldn’t oppose Williams’ latest efforts to destroy the Avengers. Vision initially refused, but departed to consider the offer. Later allied with Space Phantom in conspiracy against the Avengers, Williams revealed to Vision that he was lying about being able to revive Wonder Man’s body. But he stated that he could transfer Vision’s mind into Captain America’s body using the Space Phantom’s technology. Vision played along to infiltrate Williams’ plans but ultimately refused and turned on the Reaper. Williams nonetheless prevented Space Phantom from killing Vision, before getting defeated by the Avengers. This situation became more confused when Simon himself returned from his seeming death. He then joined the Avengers as Wonder Man. 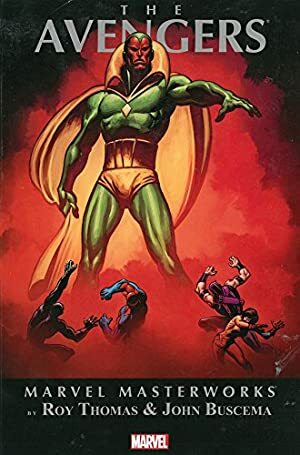 Grim Reaper imprisoned Vision, Wonder Man and several other Avengers and staged a mock trial to determine whether Wonder Man or Vision was the real Simon Williams. He decided that Wonder Man truly was his brother, and was defeated and subdued by him. Unable to accept Simon’s new superhuman form, Williams eventually decided that neither Wonder Man nor Vision was the true Simon Williams. He formed a new Lethal Legion in order to set out to destroy them both as well as the Avengers. This ultimately led to a confrontation in which Simon and Vision convinced Eric that they were legitimate living beings, and that he was their brother. Guilt-stricken, Williams fled from them and fell to his death. His dead form was later used by Immortus to battle the Avengers as a part of Immortus’ Legion of the Unliving. Williams’ lover and teammate Nekra revived him as a zombie to use as a weapon against their enemies. Sickened by his undead state, the Reaper convinced Nekra to return him to his grave. Later, though, she revived him once again, this time as a zombie who could sustain his life indefinitely by killing victims with his scythe. He embarked on a killing spree opposed by Wonder Man. In the process the Reaper murdered Nekra, the Mandrill and many others. Eric Williams then entered into alliance with the robot Ultron, intending to subvert Ultron’s plans to “robotize” the human race. But he was defeated by the Avengers along with Ultron. It is believed that at some point during this period, his right hand was severed. He replaced it with a version of his scythe that attached directly to the stump. After that, he became a more mystical being in league with various demonic forces (including Lloigoroth of the Nameless Ones and Blackheart). He tried to kill the Avengers by creating the fourth Legion of the Unliving, but was seemingly destroyed instead. Following that defeat, Williams bid his time in the netherworld until his brother Wonder Man returned from the dead once again. Simon’s return weakened the walls between the realms of the dead and the living. Taking advantage of this, Eric Williams returned to the Earthly plane. He brought with him a group of dead Avengers, which included Wonder Man, whom he had bent to his will. Williams and his undead Avengers defeated the Avengers. They plotted to drown the world in sorcerous manifestations of Williams’ pain and hatred, but the Scarlet Witch restored the undead Avengers’ free will. They turned on William,s and helped the living Avengers defeat him. Most of the undead Avengers then returned to their respective afterlives. However, Wonder Man was permanently resurrected through the sorcerous intervention of the Scarlet Witch. In turn, Simon rescued his brother and brought him back to full life. Eric Williams abandoned his fight when he was forced to admit his love for his brother. He was committed to a psychiatric hospital. Williams was soon abducted from psychiatric institution by Ultron’s robot army. He was then held prisoner as part of Ultron’s extended “human family”. Ultron revealed previous early connections to the Avengers whom he also captured. Williams ultimately helped the Avengers escape Ultron’s custody. However, he fled while Ultron battled the Avengers, renouncing his brotherly interest in Vision and Wonder Man. Refocusing to dedicate his future schemes to personal gain, Williams attempted to forcefully infiltrate the Maggia. The Avengers arrived to defeat Maggia leader Madame Masque and repelled Williams. The Grim Reaper battled through Madam Masque’s assault force while the Avengers fought Count Nefaria and the mind controlled Wonder Man and Atlas from the Thunderbolts. The Avengers saved Madam Masque from her father Count Nefaria and got Nefaria to retreat. The Grim Reaper almost escaped but was knocked unconscious by the Avenger Warbird. 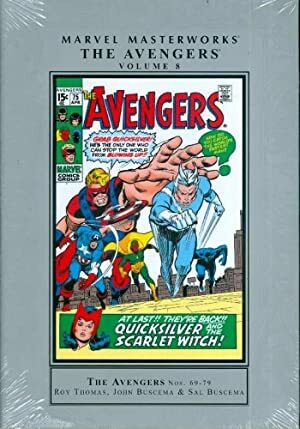 The Avengers then took the Reaper back to their mansion to interrogate him about Count Nefaria’s whereabouts, but the Reaper refused. The Avengers then turned the Reaper over to the proper authorities. The Grim Reaper is a good example of a truly psychotic villain. Throughout his life, he was obsessed with returning his brother Simon to life. He was never convinced that Wonder Man was his brother, and upon realizing that Simon WAS his brother, he killed himself. He was also a bigot, despite his love for Nekra. He’s pointless without Wonder Man. Bring them both in and stick Simon with the Outsiders. There are consequent parallels between the Wonder Man/Grim Reaper relationship and both Captain Atom/Major Force (the idea of an Amalgam version of Grim Reaper and Major Force with a Quantum Matter scythe entertains me) and The Eradicator/Connors from the Eradicator era of The Outsiders. Connors was some random scientist in the Superman titles who was studying the Eradicator (or something like that). Then it exploded and he died. The Eradicator was one of those parasites who needed people, and so he animated Connors’s body and assimilated his memories and personality. This isn’t all that different than Vision being the supposed resurrected Wonder Man. Connors could, in theory, be the “quantum clone” Nathaniel Adam who didn’t become Captain Atom, with a new identity. Reaper would hate Atom for being Adam, and then be pissed off at Adam/Connors/Eradicator when he appears on the scene. Interestingly, Reaper might go straight to combat Monarch (tying this all together with Roy’s Captain Atom stuff), when Adam becomes Monarch… if I have that all right. Area Knowledge (Las Vegas), Leadership. Maggia (High), Lethal Legion (High), Nekra (High), “The Original” Space Phantom (Low – very early costumed career), Ultron (Low). SIH of Wonder Man and The Vision), SPI, MPR (missing right hand – post-zombie era only), Power Loss : When not armed with the battle scythe, The Grim Reaper has an effective DEX of 04, lowering his AV/OV for Physical feats as well as his Initiative. SIH is no longer valid after the Blackheart alliance ends. COSTUME [/BODY/ 05, Skin Armor: 02]. Claws, Force Shield, and Gliding all represent uses of the “blade spinner” and have Minor Burnout ; none of the scythe’s other powers may be used while it is activated. Claws represents the buzzsaw effect of using the spinning blade in melee combat. Force Shield is only vs. projectile or melee attacks and will not stop energy/beam attacks. Gliding represents the use of the blade as a makeshift helicopter rotor, allowing the user to “parachute” safely from almost any height. Prior to the loss of his hand, this was a weapon with a “cup” into which The Grim Reaper could insert his hand and control the weapon. After the loss of his hand, the Reaper switched to a modified version which served in place of his hand – there are no differences in stats. Source of Character: The Avengers (Marvel Comics). Helper(s): Jay Myers, Sébastien Andrivet, Jackson, John Colagioia, Roy Cowan, Nick Yankovec, Peter Piispanen, Frank Murdock, Unofficial Handbook of the Marvel Universe for partial history and “Powers and Abilities” section, avengersassemble.org (defunct), The Gamers Handbook of the Marvel Universe.